Recently, in the workshop at the Japanese American National Museum one of the participants brought some fabric that she had dyed in another workshop somewhere. It had faded radically and even more so along the folds and creases. She wanted to know what had happened. This is something that also came up a couple of times in the online indigo workshop and was struggled with over there. Occasionally, I have seen it in my own indigo dyed pieces and strive to do those things which I find help to alleviate the problem. As far as I have been able to understand, and the experiences I have had with this type of fading have led me to the following understandings. Please feel free to jump in here and correct , inform and add to our knowledge on this for other folks as well. -fading of the fabric along exposed areas and folds where the cloth is exposed to air and or humidity. I have even seen fade lines on indigo cloth that I have hung (flat) to dry outside overnight that had a bit of a sway in the hung cloth. It seemed that in this case the overnight humidity was the over-riding factor. – ozone in the atmosphere is reacting to the cloth and any chemicals left in the fabric and additionally with UV light to produce an oxidizing effect. Smog and humidity also figure into the mix even in cloth that is well washed out. At first, I thought that only fabrics dyed in a chemical vat or a pre-reduced indigo vat were susceptible to this. Not true. They may be MORE prone to it but fermentation vat dyed indigo is also affected. What to do to minimize this? – wash out your fabrics well before dyeing to remove any chemical treatments. -build up your depth of shade over many dips in the vat. Have a light vat and a dark vat to produce various shades of blue through repeated dips and really work the dye into the cloth. -rinse your indigo dyed cloth well between dips into the vat and then finally wash them well with a good rinse in the end. You may have seen photos of Japanese dyers planting their indigo dyed cloths along a river or stream to let the water run through- this would definitely do it! Getting out any chemicals that can react to the ozone is beneficial. -once dried and ready for storage until use, you can keep your indigo cloth in a drawer or wrapped in a towel to keep the edges from fading. Finished pieces (such as a quilt on a bed, a pillow, a wall hanging) will fade more evenly and possibly without notice as they are more evenly exposed to the atmosphere. All indigo will fade with use (think denim). Well dyed dark shades built up by many dips seem less susceptible. This is one reason I prefer the fermentation vat over the pre-reduced or chemical vat-more work but a more satisfying process and result. Also, be aware that different fabrics will fade differently. Think about the weave and the fiber. There are even products out now for commercial dye houses that speed indigo fading (ozone finishing!) with the use of ozone related treatments said to be less labor and water intensive. Consulting companies work with manufacturers to troubleshoot their process and diminish the fading (or even speed it up!). What if it’s not a problem at all? It’s a matter of perspective. This entry was posted in dyeing, indigo, memory, moon, mooncloth, shibori, wondering and tagged indigo, indigo dyeing, indigo fading, ozone fading on August 24, 2016 by shiborigirl. I know that many of you are finally coming into your spring – with things warming up, plants budding out; gardening and planting might be on your mind. As you get some of that done and look forward to summer are you considering some indigo dyeing? If so, you might consider taking my online indigo dyeing class “Let’s Dye with Indigo“. Now is a good time to consider starting your vat as the weather warms up. I just started a new 40 gallon natural fermentation vat and within one week it was already producing beautiful blues. My class consists of two parts- the 5 lesson workshop plus the student forum. Both are very informative. You can easily jump from one to the other through links in the sidebar of each. Four (4) types of vats are explained and maintained. You choose which one is right for you. Although this workshop covers 4 different vat types, continuing posts will focus on the fermentation vat. There have been a lot of things fermenting around here over this past year. Many having to do with how we go about our lives- what we add to it and what we take away from it; the marks we make, the marks we leave behind, perhaps leaving no mark at all! Fermentation has produced many of the best things we can enjoy in life- wine, beer, miso, bread, yogurt, cheese, pickled vegetables and so much more (even compost!). Fermentation is a cellular process that occurs in an environment lacking oxygen that converts organic matter into simpler compounds and releases energy as a result (along with the byproduct of many delicious and useful things). Pretty cool huh? Simplifying organic matter to create energy and other good things. I’m gonna stick with that. I’ll also be adding posts about growing and using indigo as well. Why should you sign up now? For “This Week Only” (sounds like an infomercial!) I am adding in the Shibori Techniques on Silk -Self Study Online Workshop (usually sold separately for $25). The principles in the shibori techniques class can be applied to your indigo dyeing as well. This sale will be available only until this Saturday – giving me enough time to add you into the class before the Silk Study Tour to Japan departs. So both classes for the price of the indigo class. A sort of Sayonara Sale! option two: new subscriber. 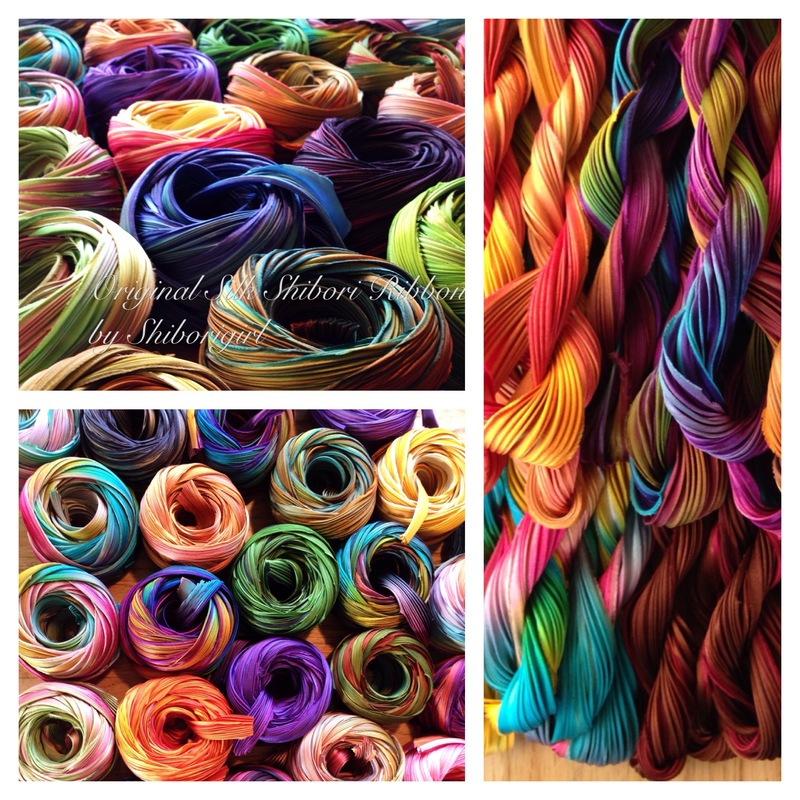 here you will get access to the full year; the upcoming Japan Silk Study Tour posts and whatever lies beyond that. the past, the present, and the future. cost is $95. Sign up in the shop here. This entry was posted in dyeing, indigo, online workshop, shibori, Silk Study Tour to Japan, the daily dyer, workshop and tagged indigo, indigo dyeing, japan, online indigo workshop, silk study tour, Textile, the daily dyer, workshop on May 7, 2013 by shiborigirl. All through the recent couple of weeks these words rolled around inside my head and I find that they apply to so many things throughout my day. All of them though, bound up by intent. I am focusing more on intent these days. Maybe focusing isn’t the right word really. At least being more conscious of it, wondering about it, taking it into consideration . Noticing it, within myself and beyond. I think that the silks that Richard brought over made it ever clear. These fabrics have intent. Working with them I can feel and see it. Even though most were produced many decades ago (and maybe especially because they were) the intent seems clear to me. They are still here. They were saved all this time. The intent was carried on through many hands into their present form. And over time here, I have been wondering not only about silk, but about indigo too. Last year I grew indigo-cut and dried it, even saved the seed. Eventually I composted the leaves into a claylike mass. Now, I have made a fermentation vat with the homegrown indigo. I think the past is about to meet the future, blending the past with the future, sustainably. This entry was posted in boro, dyeing, indigo, inspiration, me, mending, moon, shibori, silk, wondering and tagged fermentation vat, indigo dyeing, intention, silk, sustainable craft on February 11, 2013 by shiborigirl. Hello. That’s a good place to start. Yes, I’m back. Here. Houston almost seems like a dream! A wonderful show and ever so busy for me on all accounts. My sincere thanks to everyone who came, who sent in pieces for the silk exhibit, and who took my workshop. We did have a great time! Having never curated and organized an exhibit before I was pretty much winging it but in my mind’s eye I had an idea of what I wanted to communicate to viewers of the exhibit. It was also interesting to work with the exhibit staff at Quilts Inc. and see their process for receiving materials, setting up, breaking down, and returning items for the exhibit at large. Many thanks especially to Ginny and her crew who were assigned to this exhibit (they confessed that when the various exhibits were assigned they drew the short straw! in the end it wasn’t as bad as they thought-just different than the basic quilt exhibit). Thanks Ginny and crew! I got to learn a lot through organizing this exhibit. Unfortunately, when I returned I got the flu- put me a few steps back and then it was off to see my son Trevor’s senior recital-wow! -and then back home where I am still catching up on emails and orders. Also many proposals and fees for next years events are due any day now. Yikes! Glenna came with her own wonderings-about temari. 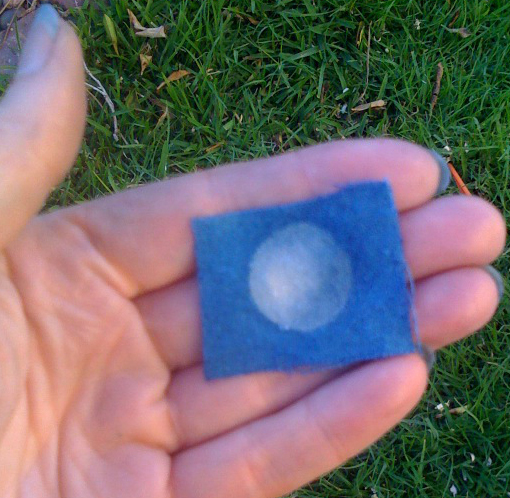 She played and devised a way to indigo dye the base for a temari. Quite inventive. I can see the possibilities now! If you are looking for a new craft to spend some serious time at check out the possibilities of making temari! I even want to try my hand at it-at least once just to gain a basic understanding. She gave me a lovely sample of her work as a gift-I love it! The gift of home grown cotton was actually from the Houston workshop-got it mixed into the wrong set- but it is beautiful and has seeds that I have separated out- I want to grow a couple of plants just for fun. More to tell, but must end it here for now- have a wonderful holiday full of thanks and giving, of friends and family. This entry was posted in Experience Silk Exhibit-Houston, houston quilt festival, indigo, japanese textiles, shibori, silk, silk experience, silk study tour, workshop and tagged exhibit, growing indigo, houston, indigo dyeing, indigo seed, japan, Japanese American National Museum, percussion, quilting, recital, seed, shibori, silk experience, temari, Trevor Dolce, workshop on November 21, 2012 by shiborigirl.